I'm in the process of remodeling a basement bathroom. It used to have a big shower in it and a vanity on the wall opposite the shower; the shower used a floor drain (obviously) and the vanity sink had a long sloping pipe to a vented drain pipe in the adjoining wall. The new layout puts the vanity and new tub/shower on the same wall right next to each other. The tub will be using the same drain that the shower used before, and I am trying to figure out what to do with the vanity sink drain. If I route it to the same pipe as before, it's about 10 feet with a right-angle around the corner. This isn't hard to do with PVC pipe alone, but I have to notch out a whole bunch of studs to make room for the 1.5" drain pipe to run the whole length (the studs are right up against the concrete surrounding the underground basement). I would really prefer not to have to notch out all of those studs--though, at least, it's not a load-bearing wall. This arrangement will require notching out exactly three studs, two of which have permanent open access via the storage area (i.e. no drywall on that side). Since we already have to trench into the concrete a bit to get the tub drain in correctly, we'll have a span of horizontal drain pipe that should allow an extra "T" junction for the drain pipe to join below the height of the tub drain itself, which should negate the possibility of any sink water flowing back up into the tub (unless the whole underground drain is clogged, but that's a bigger problem). Is there any reason not to do this? 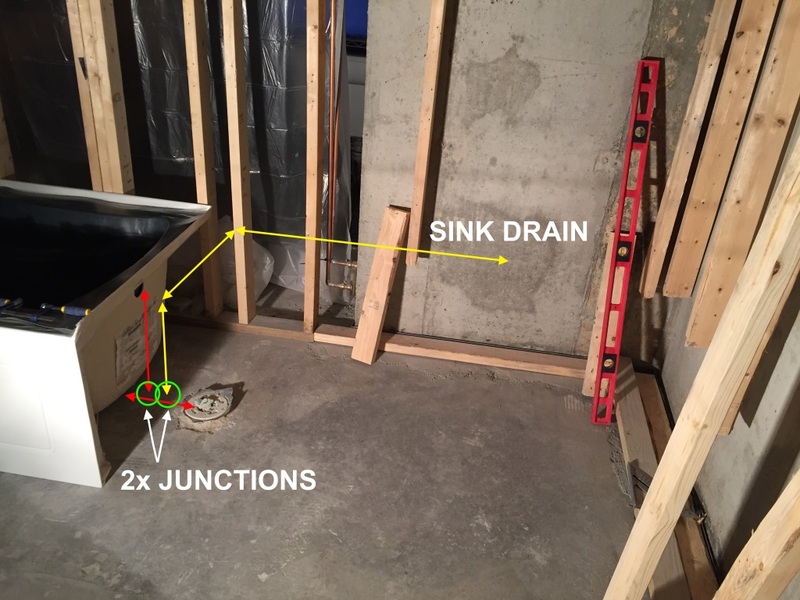 Even if I have to re-vent the sink drain, it would be far easier to run a new 1.5" pipe up the open wall and across above the ceiling (big crawlspace available) to join the existing vent. I'd do that any day over notching out all those studs. Note: I'm primarily interested in physical limitations that would make this a dumb idea, but also interested in code compliance. The home is in Virginia, USA. You cannot "double trap" any fixture. To utilize the trap in the floor for your lavatory, you need to ensure that the length of the trap arm does not exceed maximum allowable distance (42" for 1 1/2" trap arm, in CA USA, I think). It looks like you are pretty close to max distance but you did not say in your question. Also, max trap arm change of direction is 90°, but you would have two 90° bends. You AHJ might allow though if you install an accessible clean-out. Not the answer you're looking for? Browse other questions tagged drain sink bathtub vanity or ask your own question. What shape/bends should a bathroom sink drain pipe have to generally comply with US code and avoid clogs? Are the sink and washer vented correctly? Why would my plumber have installed two drain stubs for a single vanity sink?